Butler Newsroom | Professor Rao’s ‘Color Sentences’ is Now High Art. Literally. Butler Newsroom > Campus News > Professor Rao’s ‘Color Sentences’ is Now High Art. Literally. Associate Professor of Art Gautam Rao’s Color Sentences, which was selected for a citywide public project called High Art! that displays works by 10 Indiana artists on billboards throughout central Indiana, can now be seen at I-465 west between 38th and 56th streets. The list of artists selected for High Art!, their works and locations can be found here. Rao created Color Sentences for his wedding in March 2012. The High Art! 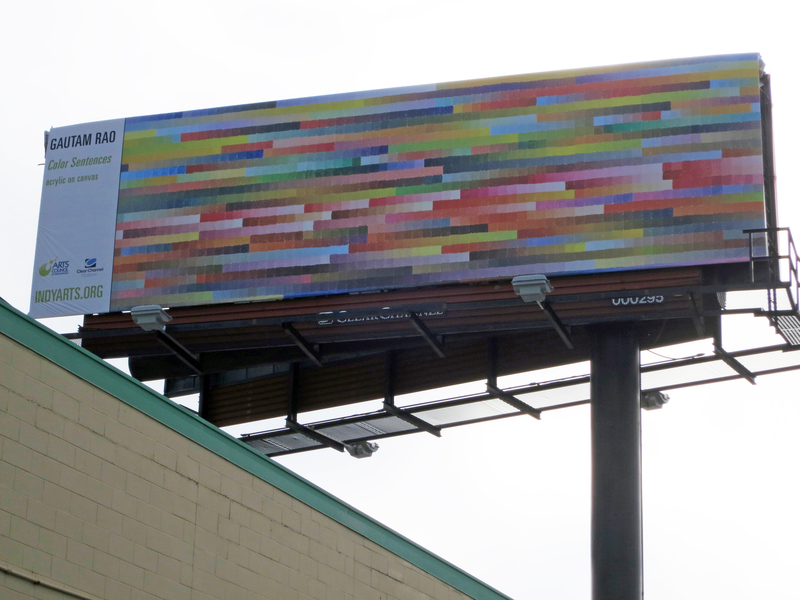 project is a creation of the Arts Council of Indianapolis, in partnership with Clear Channel Outdoor. In January 2014, each piece was installed for four weeks. After the initial period, the images will be rotated in and out of various locations as sites open up in the regular rotation of billboard advertisements. The works will rotate for one year on various billboards throughout Marion and the seven surrounding counties.